A total of 227 cross sectional images (20 x 54 mm with a resolution of 289 x 648 pixels) of hind-leg xenograft tumors from 29 mice were obtained with 1mm step-wise movement of the array mounted on a manual positioning device. The whole tumor volume was acquired using a diagnostic ultrasound system with a 10 MHz linear transducer and 50 MHz sampling. The unprocessed ultrasound radio-frequency data can be downloaded along with the liver tumor segmentation masks from here*. The dataset images are in Analyze 7.5 file format consisting of two files: a header with information about the size and number of voxels in each dimension (filename extension .hdr), and the actual data in binary format (filename extension .img). The images in the dataset are formatted according to the following protocol: CASE NUMBER | FILE TYPE (LOC OR SEG) | FILE EXTENSION | where loc is the original image and seg is the associated segmentation mask. The volumetric data are categorised into progressive versus non-progressive cases in response to chemotherapy treatment. The example_case folder contains an output of the 3D Multi-fractal Nakagami Feature descriptor (MNF) algorithm when applied to one of the liver tumour cases, see below. The group of slice images for a particular case where transformed to corresponding Nakagami shape and scale parametric images, and animated GIF images representing the fractal slice maps and a video of the corresponding fractal volume maps were estimated and included as well. 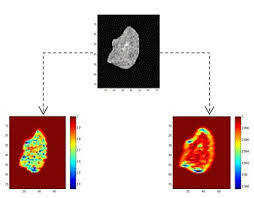 Figure showing an RF ultrasound tumour image and the corresponding multi-resolution fractal slice maps illustrating how the case responds to chemotherapy treatment – the blue color regions. *Please note that this data is the property of the Institute of Biomedical Engineering – University of Oxford and is made available for download for research purposes only. Users are kindly requested to acknowledge the source of this data and the paper below if used for any publication. All studies were ethically approved and performed in line with UK Home Office regulations, and in accordance with personal and project licenses. O. S. Al-Kadi, Daniel Y.F. Chung, Robert C. Carlisle, Constantin C. Coussios, J. Alison Noble, “Quantification of ultrasonic texture intra-heterogeneity via volumetric stochastic modeling for tissue characterization” Medical Image Analysis, 2014.